You know how every once in a while you’ll pass by someone in KILLER high heel shoes and just think [Damn, where did they get THOSE]? Unless you have a pair of smoking hot legs, it’s important you always have on drop dead bangin’ heels. Obviously it would be a little obnoxious if you paraded into work in these (depending on where you work). But when you are out on the town, it really doesn’t matter if you wear the same black dress every weekend, your heels could change everything. Typically when I walk through the mall I will notice many things. Whenever there is glitter, jewels or anything that sparkles involved I instantaneously get weak in the knees. I mean I nearly left Steve Madden the other day in borderline tears because I was empty handed. So of course the reasonable action after that day was to post all the bedazzled, glittery, rhinestoned HOT HOT high heel shoes for you all to see, buy and wear. I swear these can dress up a pair of black skinny jeans and a fidora or make you look glam paired with a little mini dress. Come to think of it, you could wear these with a bathing suit and look hot. Steve Madden Carysagg– These will make your legs look longer and the possibility of not looking hot is slim to none. 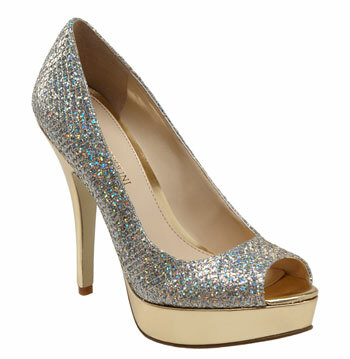 Steve Madden CARYSAGG $129.95 Available in Black, Glitter and Multi. Steve Madden Snobbie– Almost like Snookie, actually kind of reminds me of her. 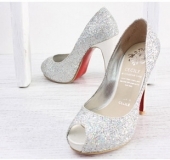 The multi-glitter ones are seriously hotter than Birthday shoes. Of course these would be killer with any little dress. Steve Madden Snobbie $109.95 Available in black, glitter and gold. These pups are FIERCE- Steve Madden Zinah. Pair with pretty much anything and everything and you’ll make a killing wherever you go. I do realize Steve Madden can sometimes be on the steeper side, especially for something that isn’t exactly a bigger designer name, but I will say that I do own about 83 pairs of Steve Madden and they are THE most comfortable shoes I own. Granted the first two or three times you wear any shoe, it’s going to hurt breaking them in, but bare with it because it will get better. 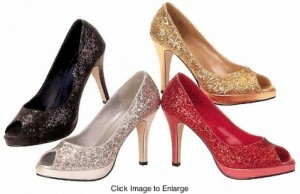 I also love these Enzo Angiolini Wizard of Oz pumps from Nordstroms, very chic and cute. These are best with colored dresses and outfits. I’m not too sure how these would look with a black dress, but I would veer away if you’re unsure. I also happened to run across these from My Diva’s Closet. I think the Silver and Black are best in these because they are a lower heel. We both know the red might make you look a little too Dorothy-ish. Finally, these were probably the closest I could find to the Steve Madden’s for a better price. A very close match, from Jacco Fashion, these designer style, silver peep toe glitter pumps are very sassy. I really like how they are red on the bottom and have a higher heel than the previous pair- which is always fun. Totally agree with you about the first picture! I have them but having difficulty finding a clutch. Any suggestions?